Current data suggest that the vestibular evoked myogenic potential (VEMP) is a vestibulocollic reflex whose afferent limb arise from acoustically sensitive cells in the saccule, with signals conducted via the inferior vestibular nerve. As VEMP specifically tests the saccule, inferior vestibular nerve, and its central connections, it could be of use in identifying saccular damage among patients with SSNHL. Such knowledge would help in understanding the disease process and planning treatment in such patients. Therefore, we used VEMP to investigate saccular damage in patients with SSNHL with or without vertigo and also to evaluate the differences in saccular damage according to the initial hearing threshold and presence or absence of vertigo. To investigate saccular damage in patients with SSNHL with or without vertigo and to evaluate the saccular damage according to the hearing loss and presence or absence of vertigo. All tests done in this study were performed in the audio vestibular unit of ENT department of a tertiary care hospital, from September 2009 to November 2010. This project incorporated a prospective observational study design. The study was approved by the institutional review board and each subject signed the informed consent to participate. All patients attending the audiovestibular clinic with a complaint of sudden hearing loss, presenting within 6 month of onset, and had sensorineural hearing loss of 30 dB or more over three contiguous audiometric frequencies that occurred over 3 days were included. Patients presenting later than 6 months of onset of the symptoms, hearing loss less than 30 dB, history of past otological surgeries, and those not able to produce adequate Electromyogram were excluded. VEMPs were recorded using an evoked response computer, a sound generator, and surface electrodes were used to pick up neck muscle activation. SmartEP VEMP device by Intelligent Hearing Systems, (Miami, FL USA) in the ENT department was used. The subject was placed in a comfortable and sound-proofed environment, sitting upright in a comfortable chair. The patient's neck was turned to one side to tense the sternocleidomastoid muscle and to attain adequate Electromyography (EMG) level (head rotation method), opposite to the ear which is stimulated with a definite intensity sound. Recordings were obtained from surface electrodes placed on, sternoclavicular junction (inverting electrode), midpoint of sternomastoid muscle both sides (noninverting electrode), and over the forehead (ground electrode). Once the subject was ready, the test was started by first rejecting any artifacts and allowing normal Electro encephalogram (EEG) activity. Settings of Smart EP-stimulus-0.1 ms click or 500 Hz, rate-3.1 to 5 per second, polarity-rarefaction, transducers-ear insert, intensity-95 dB nHL, masking-none, amplification-5 K, filters-30-1500 Hz, notch filter-off, root mean square value (RMS)-min: 50 uV, max: 250 uV, analysis time window-130 ms (−80 to 50 ms), sweeps-75-250. The VEMP testing was performed by using 95 dB intensity clicks of 0.1 ms duration at a rate of 5 per second through an ear insert. Abnormal variation in VEMP readings were noted and analyzed. Outcome variable-VEMP recording (presence, absence, or abnormal VEMP) and amount of hearing loss. The association between the severity of hearing loss and changes in the VEMP recordings were assessed using descriptive statistics. The pattern of VEMP in different diseases and also the behavior of VEMP in presence or absence of vertigo were evaluated using SPSS-15. Among 27 patients who presented with SSNHL enrolled in the study, the minimum age was 15 years and the maximum was 73 years with a mean of 43.93 and a standard deviation of 13.89 [Table 1]. Among the 27, 18 were males (66.7%) and 9 were females (33.3%) [Table 2]. [Table 3] shows the probable diagnosis in the 27 patients with SSNHL who underwent VEMP testing. There were 11 cases of ISSNHL, five cases of Meniere's disease (MD), four cases with autoimmune pathology, two cases of vertebra basilar insufficiency (VBI), two cases of chronic renal disease, and three cases of vestibular neuronitis. The cases where no diagnosis could be arrived at were 11 cases and were categorized as idiopathic. There were 11 patients with ISSNHL; nine were unilateral and two were bilateral. Out of nine unaffected ears, 88% (8/9) had normal and 12% (1/9) absent VEMP. Whereas out 13 the affected ears, only 53.9% (7/13) had normal VEMP and 46.2% (6/13) had absent VEMP. None had abnormal VEMPs. In MD, both the affected and the unaffected ear showed only small differences in the VEMP findings. 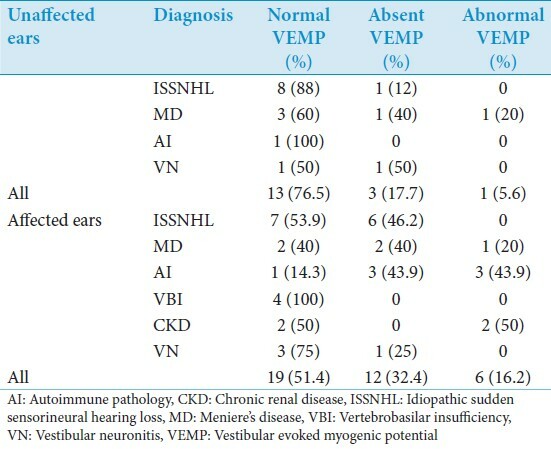 In VBI, all the four ears were affected but the VEMPs were normal in all [Table 4]. There were four categories depending on the severity of hearing loss as shown in [Table 5]. Among 54 ears, 17 ears had normal hearing. In this group, 76.47% (13) had normal VEMP, 17.65% (3) had absent VEMP, and 5.88% (1) had abnormal VEMP. Out of 11 ears in the 15-55 dB hearing loss, group 45.45% (5) had normal VEMP, 27.27% (3) had absent, and 27.27% (3) abnormal VEMP. Out of 13 ears with 55-90 dB loss, 46.15% (6) had normal VEMP, 38.46% (5) absent, and 15.38% (2) abnormal VEMP. The group with hearing loss greater than 90 dB had 61.53% (8) absent, 30.8% (4), and 7.69% (1) abnormal VEMP. Out of 27, 17 had vertigo and 10 did not have vertigo. Among those with vertigo, 58.82% had normal, 32.35% had absent, and 8.82% had abnormal VEMPs. Among those without vertigo 60% had normal VEMP [Table 6]. The objective was to evaluate the saccular involvement in the cases of SSNHL. There were 18 males and 9 females with a minimum age of 15 and a maximum age of 75 and a mean age of 43.9. All patients with SSNHL were analyzed together and the patient with ISSNHL separately. The unaffected ears in patients with unilateral SSNHL showed 76.5% normal VEMP as against the affected ears which was 51.4%. A total of 61.53% of the profound hearing loss group also had normal VEMP. There was no relation between the degree of hearing loss and the absence of VEMP, since there was no significant difference in the absent VEMP rates between the groups with different hearing loss. The finding indicates that the saccule is affected even in the normal hearing ear but lesser when compared to the affected ear and the hearing loss is not related to the saccular involvement. In patients with MD, there was no difference in VEMP findings between the affected and the unaffected ears indicating a chance of subclinical affection of the opposite side. In patients with VBI, all the four ears with hearing loss had normal VEMPs indicating no affection of the saccule. The saccule was affected in SSNHL but the extent of saccular damage did not correspond to the amount of hearing loss or vertigo. In patients with unilateral SSNHL, there was a tendency for the affected ear to have absent VEMP even though the unaffected ears also were affected to a lesser extent. Hence, there may be percentage of patients who had a subclinical involvement of the unaffected ears as evidenced by 23.5% of absent VEMP in unaffected ear. 1. Whitaker S. Idiopathic sudden hearing loss. Am J Otol 1980;1:180-3. 2. Zhou G, Kenna MA, Stevens K, Licameli G. Assessment of saccular function in children with sensorineural hearing loss. Arch Otolaryngol Head Neck Surg 2009;135:40-4. 3. Golz A, Westerman ST, Westerman LM, Goldenberg D, Netzer A, Wiedmyer T, et al. The effects of noise on the vestibular system. Am J Otolaryngol 2001;22:190-6. 4. Perez R, Freeman S, Sohmer H, Sichel JY. Vestibular and cochlear ototoxicity of topical antiseptics assessed by evoked potentials. Laryngoscope 2000;110:1522-7. 5. Khetarpal U. Investigation into the cause of vertigo in sudden sensorineural hearing loss. Otolaryngol Head Neck Surg 1991;105:360-71. 6. Zhou G, Cox LC. Vestibular evoked myogenic potentials: History and overview. Am J Audiol 2004;13:135-43. 7. Hong SM, Byun JY, Park CH, Lee JH, Park MS, Cha CI. Saccular damage in patients with idiopathic sudden sensorineural hearing loss without vertigo. Otolaryngol Head Neck Surg 2008;139:541-5. 8. Iwasaki S, Takai Y, Ozeki H, Ito K, Karino S, Murofushi T. Extent of lesions in idiopathic sudden hearing loss with vertigo: Study using click and galvanic vestibular evoked myogenic potentials. Arch Otolaryngol Head Neck Surg 2005;131:857-62.